Putting on the Mask of True Sight allows me to see this disgusting foe. It occurred to me recently that the two great loves of my life–jazz and CRPGs–have something in common. They both draw from a variety of templates, and the real joy in a performance is seeing how a particular band or artist has chosen to improvise on the template. (I should clarify that this is true of the type of jazz I like, anyway. It’s less true of free jazz and other avant-garde styles whose appeal has always mystified me.) A new composition is always nice, of course, but it requires a depth of engagement and attention that you’re not always ready to give. In contrast, you almost never mind hearing a familiar composition played in a new way. That makes it all the more disappointing when you sit down for a performance and don’t find anything new at all–a copy rather than an improvisation. No jazz fan wants to hear a number played entirely “straight,” and no CRPG addict wants to start, say, a Dungeon Master clone just to find a literal clone. And that’s largely what we have here. 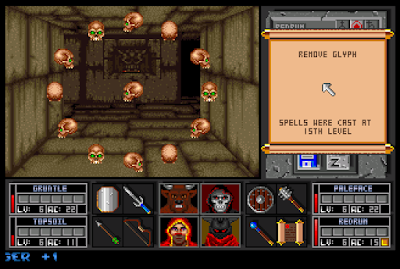 In its best moments, Black Crypt recalls good times playing Dungeon Master, but it offers too few variances to those moments. The game has occasional moments like this to remind you of the plot, but they’re few and far between. 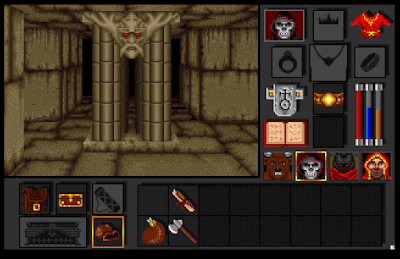 I’m less than halfway through the game, and it thus might improve, but so far all Black Crypt has done is to make Dungeon Master a lot bigger; as I noted last time, it has 28 levels. 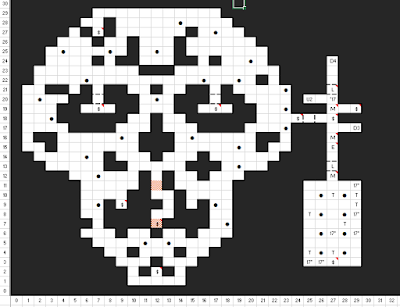 I rather hoped that with so many levels, and with so much space devoted to each level (the coordinates go up to 40 x 40), Black Crypt might achieve a nonlinearity that previous games in this lineage have lacked. I thought we might see multiple ways up and down–a true three-dimensional maze rather than a steady progression of levels. Well, the game absolutely does have multiple staircases per level, but you still reach them in a somewhat fixed order. At any given moment, you rarely have more than two choices for your next move, and one of those will almost certainly resolve into a dead end. I had also hoped that Black Crypt might do more with its story. 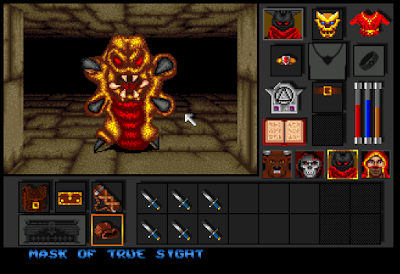 As I noted last time, many of the mechanics owe more to Eye of the Beholder than to Dungeon Master, and I thus hoped the game might introduce some NPCs or in-game story development the way that Beholder did. Alas, there’s been none of that so far. And I’m disappointed that the game didn’t fix many of my other complaints about previous Dungeon Master-like titles, including a lack of enemy names and a lack of information on equipment. The Bracers of Agility will, at least, reflect their influence in the character attributes. What’s left is not an unpleasant experience, just a highly-derivative one. Fortunately, it’s been a while since the last Dungeon Master clone, so at least I didn’t start this game exhausted with the entire sub-genre, the way I currently am with Ultima clones. In this last session, I explored Levels 3-9 of the dungeon. I should perhaps say “partially explored,” because there’s a lot of unused space on each level, and it’s entirely possible that some teleporter or staircase will later bring me to those unused parts. I doubt it however, mostly because the game occasionally makes a big show of loading when you transition between levels. 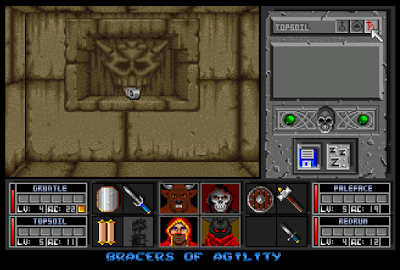 It did this between Levels 2 and 3, between Levels 5 and 6, and between Levels 9 and 10. (In contrast, the game barely blips when you take a staircase between, say, Levels 7 and 8.) I think we can therefore regard each level “group” as a separate section of the dungeon. Indeed, as I explored Levels 3-5 and 6-9, there was a lot of interconnectedness between levels in a group–but only a single staircase between the major “group” transitions. Level 3 had a “skull” theme going on. Within each group, the specific level order was nonlinear (in the sense that progression didn’t go in the specific order of levels; it was still a very narrow path). 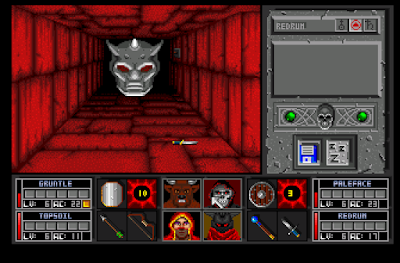 For instance, I couldn’t explore most of Level 3 until I had a Mask of True Sight, which let me see the invisible enemies on that level. The mask was found on Level 4, but I had to make some diversions to Level 5 along the way. Among the next group, I spent only a small amount of time on Level 6 before a teleporter took me to Level 9. After a long time mapping that level, I finally went back up to Level 7, which had a lot of stairways up and down to Level 8. 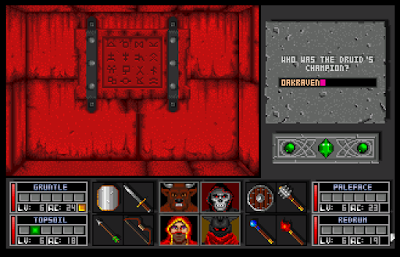 This interconnectedness within level groups extends to the game’s puzzles. Pressing a button on Level 8 might open a wall on Level 7. Regrettably, there has been nothing thematic to all of these levels. 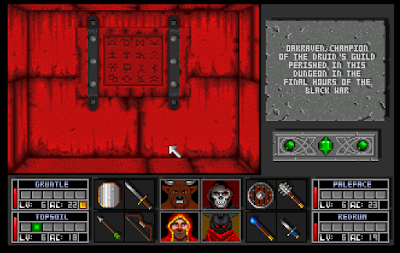 Again, I think to the Eye of the Beholder series, where you had the dwarf and Drow levels in the first game, and the clear distinction between the living quarters and basement in the second. Here, we don’t even have much variation in texture–just the occasional use of a different color, as if the level was shot through a red filter or something. As a consequence, even a day after playing the majority of this session, I have to refer to my maps for reminders about the specific order in which I did things. You really have to carefully study the walls for buttons. A long north-south hallway of 12 squares with alternating east-west alcoves. Each alcove contained a skull. Nearby messages remarked, “A year of death counted in souls. One for each moon, four is your goal,” and “February, April, July, October.” It was clear that I had to regard each square in the hallway as representing a month, and to remove the skulls for the alcoves that represented February, April, July, and October. Choosing a wrong skull meant activating a trap. The order of months turned out not to go in a linear manner along the hall, but rather up one side and then down the other. Several magic mouths that required me to answer a question based on other messages found in the dungeon. For instance, Levels 6-9 had repeated messages about an archdruid named Oakraven (one of the four heroes from the backstory), who is buried below in a coffin of Whiteoak. Both words were answers to magic mouth riddles. Getting some lore . . .
. . . and using it to answer a puzzle. On Level 4, I had to collect water from four symmetrically-placed fountains and then put those waterskins into special alcoves on Level 5. The hardest part of this mission was differentiating the “special” waterskins from the other waterskins in my possession. Solving puzzles can have a variety of effects. Locked doors might open, hidden doors might reveal themselves, wall spaces might open up, pillars might disappear, and new switches and buttons might appear on previously-blank walls. I’ve found that in this game, it really makes sense to map everything before touching everything, then search for the type of secret door that you can bump into, and finally try the switches and buttons, carefully noting the changes to the environment. A lot of the game’s puzzles involve removing pillars like this. Let’s talk about combat. Level 3’s invisible enemies, when I wore the Mask of True Sight, turned out to be these giant grubs with teeth and claws. They’re capable of inflicting poison, but fortunately there are a lot of anti-poison scrolls and potions on the level. Level 6 introduced these single-eyed things that appear to shuffle along the ceiling. 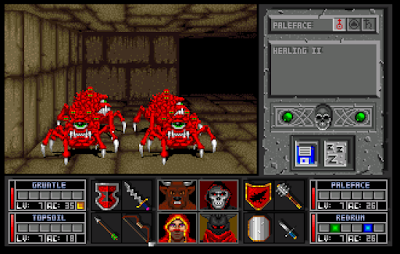 Levels 8 and 9 had floating, metallic, horned heads as well as shape-changing slimes. This guy reminds me of something that I can’t place. The spellcasting version of this monster was very tough. Of some annoyance is the fact that enemies in this game vary even among the same type. Some of the grubs moved faster, hit harder, had more hit points than the others. Some of the one-eyed ceiling creatures and floating heads are capable of offensive spells and some are not. These variances make it hard to find a consistent strategy. On strategy that doesn’t work very well is the old combat waltz. It can technically be done, and I’ve used it a few times to weaken a couple of enemies prior to the main onslaught, but rarely can I keep it up for the duration of an entire combat. Enemies are simply faster here than in most Dungeon Master derivations. They move faster and, more important, they turn faster. You don’t have the same kind of pause between an enemy arriving in a square, turning to face you, and attacking. You really have to be prepared to fight head-on with weapons and spells. Occasionally, it’s possible to enact some of the other “guerrilla” maneuvers possible with this combat engine, including “stair-scumming.” Enemies that walk on the ceiling cannot pass through door frames, which offers some hit-and-run opportunities. All told, though, combat is a less frequent experience with Black Crypt than with most games of this ilk. Sometimes half an hour passes without a single enemy. Character leveling is also a bit under-emphasized. My characters are all Level 7 currently, but that doesn’t mean much more than more hit points. Spells are learned by finding books, not leveling (although level does affect spell power). There are a few pressure plates that cause enemies to spawn, in case I ever feel like I need to grind. A lot of the mechanical puzzles are about lowering pillars that otherwise block hallways. This is slightly original, although when you think about it, there’s little difference between a pillar and a door. Wow has the clicking-on-the-portrait-instead-of-the-weapon thing been a problem. I screw it up almost every time I’m fighting a new combat for the first time in, say, five minutes or more. Another interface annoyance: the function keys are in a non-obvious order. F1 and F2 activate the upper-left and upper-right characters, which makes sense. But F3 activates the lower-right and F4 activates the lower-left. There’s a logic by which this makes sense, I guess, but it’s still a bit unintuitive. When a character dies, in addition to all his equipment, he drops a “death gem.” You need the gem to later perform a resurrection on him. The dungeon is strewn with the death gems of previous adventurers. The manual makes a point of saying that you can’t resurrect the owners of these gems, but I wonder if there’s any reason to collect them anyway. I have been, just in case. A death gem next to a note from the adventurer who left it. The thieves from Level 3 (discussed last time) did end up dropping the stolen items when I finally tracked them down and killed them. The party frequently comes across glyphs (which activate traps when stepped on) and corridors blocked by force fields. These are removed with the “Remove Glyph” and “Dispel Magic” spells, accordingly, but sometimes the character level isn’t high enough to cast strong enough spells. 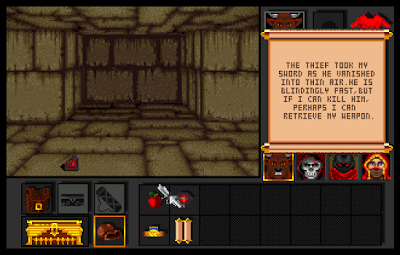 In those cases, you have to find scrolls with the same spells, with the scrolls encoded at a higher level. My regular “Remove Glyph” didn’t work here, but this scroll, encoded at the 15th level, will have no problem. The game is effective in its use of sound. Every enemy has an attack sound and a separate movement sound. The movement sounds help you determine how close an enemy is, and it can be freaky when you hear it unprepared. There was a large area of dark squares on Level 9. Dark squares are brightened with the “Light” spell, but the spell has a very short duration. The cleric’s “Create Food” spell and the frequent appearance of fountains makes food, water, and rest less of a problem than they could otherwise be. It still annoys me that characters start taking damage from hunger and thirst when the meter has plenty of room to go. My general practice is that every time I find a fountain, I first rest to restore my fatigue meter, then cast “Create Food” and give everyone a meal, then drink water until I can’t drink anymore. These occasional interludes generally keep the party happy. Level sizes have been extremely variable. Levels 3, 4, and 9 all used between 300 and 600 squares, but Level 8 only used 56 squares, and Level 5 only used 29. Level 8 was kind of like the unfinished basement of Level 7. Maybe more of these squares will get used later. Black Crypt gives slightly more equipment feedback than its cousins, although not much more. I’m carrying a long sword +1, a “Hopeblade,” an “Ogre Blade,” and a blade called “Frost Razer,” and I can’t tell you which is the best among them, or by how much. However, there are little squares beneath each character portrait that provide some feedback on any magical effects an equipped item is having, such a fire resistance, cold resistance, magic shield, and water breathing. But these don’t seem to tell the full story. For instance, my fighter has a helm called “Mage Bane” which has to have some anti-magic effects or some effects against mages, right? Not in any way that you can tell from looking at it or wearing it. Arriving on Level 10. This game is really fond of one-eyed things. As I close, I’ve just arrived on Level 10 and have encountered a bunch of little one-eyed spiders. There’s still a lot of room for the game to introduce some plot and non-linearity, and I really hope it takes advantage of these options before the end. I haven’t made zero progress with The Seventh Link, but there hasn’t been enough to blog about. It’s an extremely frustrating game. 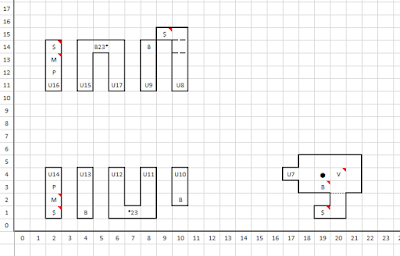 Simple math explains much of the reason: to explore the opening castle fully, I need about 1,200 gold pieces in keys. I might earn an average of 15 gold pieces per random combat. It takes me roughly 7 minutes to find and fight each combat, which I only have a 50% chance of winning, so we’re looking at (1200/15) * (7/0.5) / 60 = 18.67 hours before I can even explore the castle, not including the money I need to replenish all the food I waste in the meantime, nor all the time it takes me to trek to the fountain under the castle to replenish spell points. I found a dungeon, but it turns out that exploring it at my level is not an option. I don’t even know how to level up. The documentation suggests I ought to be able to do it at the mage’s guild, but there doesn’t seem to be any option there. Hopefully, I’ll get over a hump eventually and the entire game won’t be like this, but overall Link needed to be more generous with its resources. Any game needs at least one generous resource to make progress manageable. 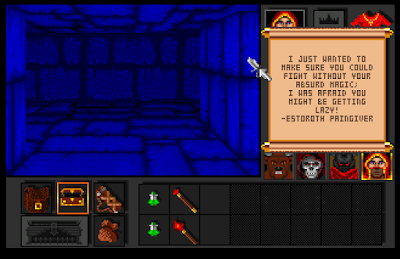 If there was no need for food, for instance, or if chests respawned in dungeons (the way they do in the Ultima series), or enemies carried more gold, any of these options would loosen the formula a bit and allow some progress. My mage and his new thief companion approach a dungeon door. I did manage to find a second NPC to join the party, so perhaps things will move along a bit faster now. Otherwise, I’ll probably have to add a third game to the rotation.